Supreme Court order blocks application of restrictive Texas abortion law. 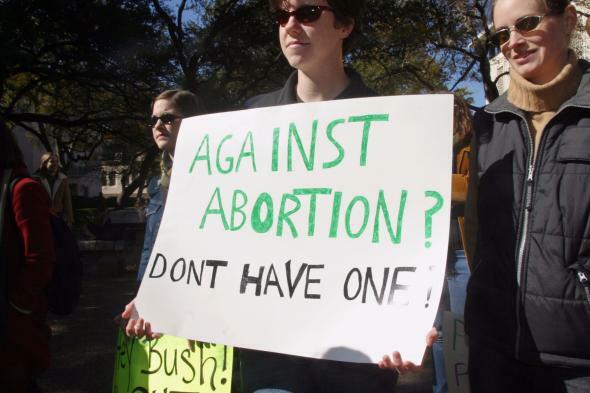 Abortion rights demonstrators at the University of Texas. The Supreme Court on Tuesday stepped in and paused the shuttering of abortion clinics in Texas that were closing down due to a stringent new state law restricting the facilities where the procedure could be performed. The court issued an order that will allow 13 clinics in the state to reopen while the 2013 law goes through the appeals process. * The intervention by the Supreme Court comes after earlier this month the 5th U.S. Circuit Court of Appeals removed a district court judge’s stay on the Texas law, allowing the law to go into effect and forcing the closure of all but eight clinics in the state. The 5th Circuit decision had blocked an August ruling by Austin-based U.S. District Judge Lee Yeakel, who had found that requiring hospital-style upgrades was less about safety than making access to abortion difficult. Yeakel’s ruling temporarily suspended the upgrade rules before they could go into effect Sept. 1 — and the order from the Supreme Court means they are on hold again. Allowing the rules on hospital-level upgrades to be enforced — including mandatory operating rooms and air filtration systems — shuttered more than a dozen clinics across Texas… Some other clinics, meanwhile, had closed even earlier amid enforcement of the rule on admitting privileges at nearby hospitals. That portion has already been upheld twice by the appeals court. “Tomorrow, 13 clinics across the state will be allowed to reopen and provide women with safe and legal abortion care in their own communities,” Nancy Northup, president of the Center for Reproductive Rights, told the Times. Correction, October 20, 2014: This post originally stated the Supreme Court order allowed the eight remaining abortion clinics in Texas to remain open during the appeals process. Those clinics already meet the new threshold set by the law requiring abortion clinics to meet the same standards as “ambulatory surgical centers.” The order allowed 13 clinics that did not meet the new state requirements to reopen while the new standard is reviewed by the courts.